This a superior quality featherbed right out of the box. There isn't a chemical or strong feather smell. I love the separate down layer on top of the feathers. The fitted bottom is an added bonus. Perfect choice for your bed. Crafted with a 100-percent cotton cover, this featherbed topper is stuffed full of plush 550 fill power white duck down and feathers. This high-end design features sewn-through construction to keep the fill evenly distributed throughout the featherbed. This mattress topper gives your mattress pillow-like softness and it is hypoallergenic for a more restful night's sleep. What a wonderful surprise to receive such a "High"quality product! I have bought many high priced down products, including feather beds and must admit that this is by far the nicest feather bed I have ever had. For this quality I would have expected to pay 3X's the cost. I highly recommend! My new mattress is firm, so I put a memory foam topper on it, which just made it hot and firm. I added the CozyClouds feather bed to soften it, so I could sleep on my side. It's not as soft as I expected and it weighs so much, I didn't want to go to the expense of sending it back. I researched feather beds before this purchase, but I think this is one of those items you have to feel in person to evaluate. Don't get me wrong, it's soft, just not as soft as I expected, and it's better than sleeping on the hot, firm topper. I have a mattress in great condition but lately we haven't been sleeping well on it, plus we wake up with stiff necks and shoulders. I was thinking about replacing the mattress but after reading the topper review decided to go this route instead. I AM SO GLAD I DID! I got this topper for my California King mattress. It is a perfect fit, added at least 2 inches to the height of our bed. We sleep like a baby now every night. I'm so happy with this product. Nice and thick and plush. My fiance didn't toss nor turn the entire night! Very happy with this buy. I started looking at feather beds for a slightly unusual reason--two years ago, I decided it was time to replace my very old, traditional spring mattress with a brand name memory foam one. With a mattress pad it was soft enough... But it seemed to be smaller than the traditional full sized mattress dimensions. The top of the mattress fit oddly against my headboard so that my pillows constantly sank down between the mattress and headboard. To add to the annoyance, my standard fitted sheet wouldn't remain taught--it wrinkled and crumbled within two days of being washed. I needed something to add bulk to my mattress. I've used memory foam toppers before, but found that they retained body heat and, probably due to lack of support, made me sore. I stumbled on feather beds as I was looking for a down comforter, and decided to give it a shot. I looked and researched for several weeks before deciding on this one. I was attracted mostly to the fact that the top layer is down, and secondly by the extra height it would give my mattress. I ordered a queen for my full bed--in the past, I have found that many toppers run small and that sizing up is necessary to ensure adequate coverage. In this instance, I think a full size would have fit very well. I kept the queen though, and put a traditional queen size mattress pad/cover over it for protection. I was basically able to turn a full size bed into a queen size, which was awesome! And my standard full size sheets were nice and tight. I've had it on my bed for about two weeks, and absolutely love it. I personally do find that it is like sleeping on a cloud. It's very soft. If it were any softer, I think it would hurt my back. As it is, it's perfect. I'm lazy, so I only fluff it once or twice a week when I change the sheets. The down and feathers pack down a little (as all feather/down products do), but even without fluffing it's soft, cozy, and super comfy. I haven't had one feather poke through either. Every time we we've gone to a really nice hotel in the past few years, I've noticed that they all have feather beds on the bed. Why not have that extra luxury at home? I did a lot of research before I purchased and this one fit the bill. I was specifically looking for one that would give me the soft as a cloud feel I wanted without raising the profile of the bed too much. Anything more than 2" to 2.5" thick would have made my coverlet quilt too short on the sides. We already have a pillow top mattress so I don't need one of the thicker 5" models. I also loved that this one has a separate chamber with down on top. We haven't had a single feather quill poke through. If you already have a comfortable mattress, you can't go wrong with this one. This thing is amazing. I have a bad back and am in bed most of the time. This lovely item is decidedly being bought for the rest of the household as I can get it. The top is so fluffy and luxurious you feel like your sleeping on a cloud. Since I have been using it I have been getting to sleep in half the time it normally used to take me. Members of the family will come in and just snuggle cause my beds to wonderful NOT to come snuggle on... like floating on a cloud! This featherbed is very well made and secures to the mattress just like a fitted sheet, which prevents it from shifting in any direction. The pocket has enough elasticity to accommodate a variety of mattress depths. It's really not as soft as I thought it would be, but it did add just enough cushioning to our very firm mattress to make it more comfortable to sleep. A fluffing every week or two keeps it in good condition, and because it has enough fill and is well constructed, there's no problem with the feathers and down migrating or clumping, even between fluffings. It also keeps you nice and warm on winter nights! :) I'm very happy with this purchase and would recommend this item to others. I’ve had this mattress topper for several years now & I love it! Really substantial fill, it does shift a bit, but shakes out really nicely, definitely recommend. Excellent product. It made a huge difference in the way I slept. I strongly recommend this product. Sleeping on a cloud is marketing hyperbole but this is an excellent product and an excellent price. This is the third good to excellent feather bed we have owned. The down top stops the feathers from poking through. If you fluff it a bit and turn it around on the bed each time you change the sheets, it does not get excessively flat. We have not experienced feather loss. We purchased this to soften an ultra firm mattress. It does the job very nicely. No problem with fitting an extra high queen mattress. The purchase and delivery service from Overstock was also excellent. We bought a new Temperpedic mattress which is very well made and supportive ($*.***). It is however a little firm. I am a very still side sleeper and was getting hip pain. My wife was getting shoulder pain, what to do? Sleepys will take it back, but then what? Decided to try this topper and it did the trick. This is not a deep "sink-into-a-cloud" topper. It adds the the right amount of softness and cushioning to a firm mattress. We are very happy now. Awhile ago, I slept on a full down mattress topper. It was was an unforgettable experience. I swore I would get one, but it was cost prohibitive. Then, I came across the CozyCloud, feather on the bottom and down on top and decided to give it a try. It was wonderful; clearly the next best thing. So glad I made the purchase. We ordered two for our king adjustable bed we just bought from Overstock. We got the twin XL and it fits perfectly over our foam mattress topper. Makes the bed luxurious and cozy. Well made and would recommend! Fluffs up beautifully, just like the picture but as soon as you lie on it, it compresses down, could use more filling but is still very nice and helps relieve pressure points beautifully. Like that it humanely acquired and the animals are not tortured.Would not have bought it otherwise as I abhor and will not perpetuate live plucking! I swore that I'd wait at least 90 days before writing my review about this featherbed...and I BARELY made it! You guys, STOP reading reviews and STOP searching, you've found the featherbed that you've been looking for! My fiance and I purchased a bed online in December 2015 that was a tad bit too firm for my liking. After 6 months of suffering with a mattress foam topper, I finally decided to purchase this featherbed. As you can see, the star rating based on the other reviews pretty much says it all - this feather topper is AMAZING! We fluff it up each time we change the sheets (every few weeks) and it's like sleeping on a cloud. My favorite feature is how it has stretchy sides that fit over the bed so the topper doesn't wiggle around and stays firmly in place. Don't hesitate to purchase this guys, you won't be disappointed! Great topper. Transformed a guest bed that hurt everyone's hips into a cozy sink-into-the-bed cacoon. Good quality featherbed mattress top. Felt like I was sleeping on some clouds, and did not feel too hot. The feathers were evenly distributed, but did need re-fluffing every week or so. I didn’t like this because you have to shake it out every day, which means unmaking the bed and remaking it. If you don’t shake it out, it goes flat and lumpy where you are laying. If you don’t mind doing this, it is very soft. Wow! It is like sleeping on a bed of feathers. Well, it is a bed of feathers but actually feels like you'd imagine which is harder to find although many say they do, this one ACTUALLY does. Great buy! After reading through reviews on this down topper, it seemed like a good choice to add much needed comfort to my "too" firm mattress. I'm delighted to find out the reviews were spot on! I fluffed after receiving and was pleased to find it had none of that unpleasant odor that needed airing out! It went right on the bed and it feels SO puffy and soft. Love it! I would give it 5 stars because it has held up well, but I have to go 4 because it is a slightly bit rough to be on top of at night. I have 2 of these, one for camper and one for home. I purchased this featherbed over a year ago and it is still holding up very well. Very comfortable and I particularly like that it is machine washable. amazing. best topper I have ever purchased. very sad they do not make it in king size now. This is a large heavy featherbed. It is super comfy but also pretty warm. I find it best to use in colder climate. Or sometimes if I have to pull out the blow up mattress it works well on that. "Hi there - why is there no King size? I’ve been checking back for over a year." "Are the feathers or down chemically treated in any way (flame retardants, formaldehyde, etc)?" No, this is not treated with flame retardants. "Do you need larger size sheets with a feather topper? My daughter has a queen size bed. Is it smarter for me to get king size sheets?" It would be best to buy deep pocket Queen size sheets for a good fit. "Does this product come with an attached stretch knit skirt"
This feather bed yes attaches with a stretchy like skirt to mattress. I also have to say we love it... I rotate and fluff each week when I change the sheets.. Also my daughter got sick in our bed so I had it professional cleaned, 50.00 and it was still as wonderful as first day I recieved and put on bed! Let it lay out first day to fluff up it is like four times bigger after! "How bulky is it when off the bed? I need a featherbed topper for a firm sofa bed in a studio apartment, but I need to be able to store it without too much trouble when I take it off the bed..."
If folded, smoothed, rolled and secured with say a bungee cord, you can get it to be pretty small in diameter. Currently my son's is stored like this and put in a trash bag for the summer. Will be going back on his bed when he moves back to school. It is very bulky! I loved it when on my temporary beds (which are now my guest beds), but I just don't know where to store it. I have it in a large garbage bag, but mine is king sized...two twins together. That makes a difference. The bungee cord might be a great answer. How often it would be removed is another consideration. Best wishes in finding the right topper for your needs. 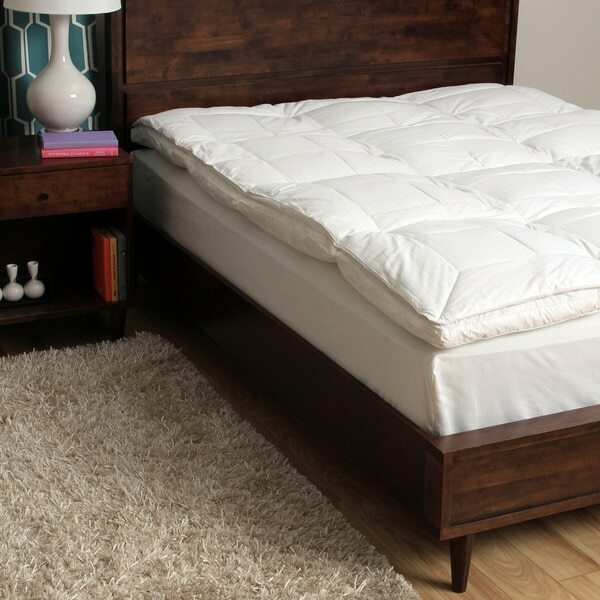 "My current feather bed/topper has feathers that start to poke through from time to time. Will that happen with this product? Thanks"
Depending on how well you care for your featherbed, it may happen from time to time. "Does it have straps to hold it in place?" This item has four side skirts with 1/4 inch elastic band overlock sewn around the bottom. Things to Know before Choosing a Down Featherbed from Overstock.com. Our guides provide customers with information about choosing a down featherbed. How to Set Up a Featherbed from Overstock.com. Our guides provide customers with information about how to set up featherbeds. How to Clean Down Featherbeds from Overstock.com. Our guides provide customers with information about how to clean down featherbeds. A memory foam mattress topper can transform the feel of your bed, improving your sleep experience. Choosing the right topper thickness will keep you cradled and comfortable all night long. Use these suggestions to narrow down your options. How to Keep Cool with a Memory Foam Topper from Overstock.com. Do you get warm when you sleep on memory foam? Check out these tips on keeping cool with a memory foam topper. Thin and firm or thick and soft? Mattress thickness can affect price, comfort, and even the sheets you can use. Learn more about mattress thickness here.